Create Embellish Adore: Last Easter Greetings... well maybe! Last Easter Greetings... well maybe! 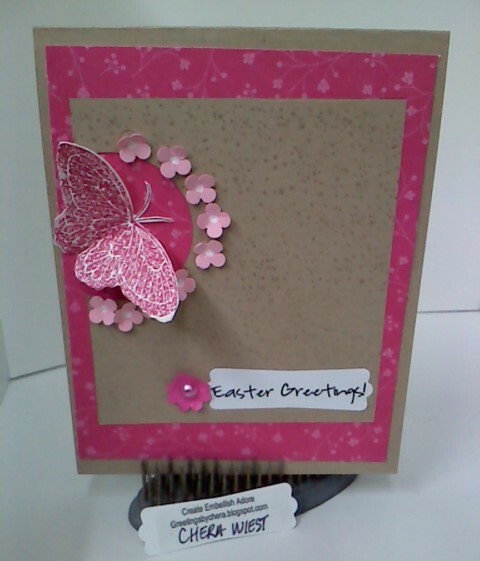 Since I was alittle occupied with company, here were two other cards that I put together for Easter. They were fun to make. I used a sketch - however cannot locate the layout blog name to tag back to.. which is fine... 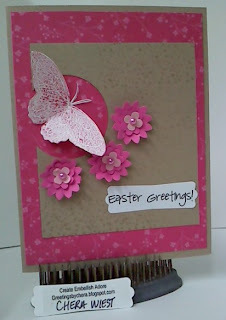 I used some of the Ice Cream Parlor DSP from the Occasions Mini. The butterfly hails from the Strength & Hope stamp set, that $2 of every set goes to the Breast Cancer Research Foundation. WAHOOO!!!! Way to go SU! and supporting the tatas! Again, with the only change being the flowers. Loving the simplicity of these cards. They are lovely.